I bring you… spring in a dish. Sunshine in a dish, with chicken. Uh, yes, OF COURSE I’d like to eat a bowl of sunshine. Let’s do it! My all-time favorite risotto (at least at this very moment, at 11:16 PM on a Tuesday night in March) is this red wine goat cheese risotto. I remember the exact day I shot the photos, nearly every time I’ve made the recipe, how it tasted the first time I tried it. 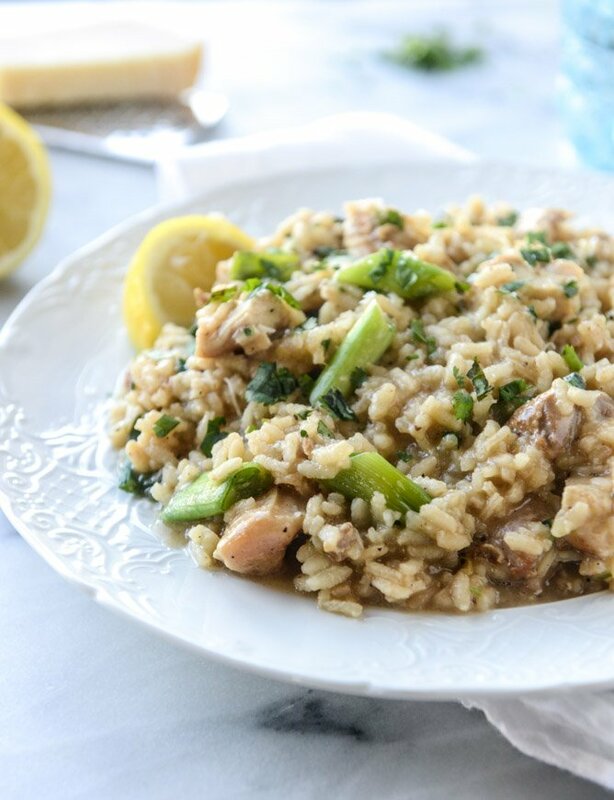 It’s one of those recipes that really solidified risotto as a simple one-pot, weeknight friendly meal in my kitchen, regardless of the arm workout or how long someone says I need to stand over the stove. Hush hush. It’s easy! AND. I can add lots of cheese and hide it under all the rice. No one knows about all of that secret cheese. Almost every single time I make risotto, it acts as a side dish. It’s often vegetarian for me except for the occasional time when I trip and drop a handful of super crunchy bacon into the pot. So, tell me about Easter brunch! Do you do Easter brunch? Do you serve one? Host one? Attend one? I’m fairly late to the game, but to be real that honestly translates to the fact that I can never make up my mind and don’t like to plan too far in advance. Because what if I want something else? What if I feel like chocolate croissants instead of cinnamon rolls? It’s that type of thing. Hence why I’m still working on my Easter brunch menu. This is a contender though! For so many reasons: tastes like spring, can be made in one pot, acts as a full meal, thus leaving me room to serve lots of empty extras like sticky buns and bacon wrapped figs and chocolate peanut butter filled eggs. I didn’t solely make it for that purpose, since it also makes a fantastic mid-week meal. It sort of feels fancy, but it’s not. It’s not unhealthy, which works for Monday through Thursday (I know you feel me). It’s comfort food, but not super heavy comfort food. It’s the kind that helps carry you into warmer weather, when the mornings are 33 degrees and then you’re sweating in the sun come two o-clock. And also! Here’s a secret. It even tastes good COLD. Oooh. Write that down. Pat the chicken completely dry with paper towels. Season with the salt, garlic powder and lemon pepper. Heat the oil in a large saucepan over medium heat. Once hot, add the chicken and cook on both sides until golden brown and cooked through, about 4 to 5 minutes per side. Remove the chicken and plate it on a cutting board. Once cool, slice into pieces. With the saucepan still hot, add the butter. Add the rice and stirring often, toast the rice until it’s somewhat translucent, about 5 minutes. Stir in the garlic and cook for another minute. Stir in the white wine, constantly stirring or at least stirring every minute or so, until the rice absorbs the wine. Once the wine is absorbed, add in 1 1/2 cups of the stock, stirring until the rice absorbs the liquid like it did with the wine. Repeat this 2 to 3 more times, until all stock has been added and the rice is al dente. You want it to appear “hydrated” – and want there to be some liquid left when serving. This process should take about 15 to 20 minutes. Stir in the scallions, lemon zest, parmesan, basil and parsley. Taste and season the rice additionally, more salt or pepper if needed. This will differ on the salt level in your stock, so don’t be afraid to add more. Stir in the sliced chicken. Serve immedaitely with extra chopped herbs on top and lemon wedges on the side. Looks amazing!! Always wanted to try risotto, but a lot of recipes seemed daunting to me, but this one seems doable! Thanks for that! Heading to Florida on Friday and anything that takes me away from Buffalo bleak weather sounds excellent to me! I love yellow and green food. It just makes me happy. Like those bacon wrapped figs you mentioned. I have a fig tree! so jealous of the fig tree! The sun is out here today and I think this would be the perfect meal for such a nice day! We love risotto, mainly because you can add CHEESE. yes. LOVE this! I think this would definitely be a winner for Easter brunch and then bring on all the bacon-wrapped figs. Those sound like heaven! My go to risotto usually has italian sausage, red peppers, and mushrooms. It’s heavy and delicious. This one sounds amazing. I’d throw some asparagus in there too! ooooh that one sounds SO good. This looks absolutely delicious! We make risotto a lot in our house, but never as a main course. That’s going to change! OK, if you love risotto, you absolutely MUST try this Butternut Squash & Goat Cheese Risotto (it’s right up your alley!). It’s my all-time favourite risotto recipe! I cannot get enough. um yes, that IS up my alley!! i’m going to try. thanks! I’m a big lover of Risotto. But it’s always vegetarian. This looks amazingly delicious. Should give it a try. 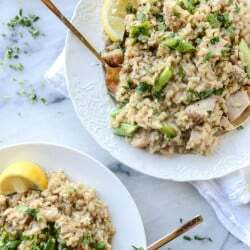 I am loving on this lemon chicken risotto! I always tend to eat risotto in the cooler months to warm my belly and my heart, but this is making a strong case for spring risotto!! i was the same way too! these flavors make it feel sort of.. lighter? I am so excited that spring is finally here! Can’t wait for all the spring produce to return. And yes, who doesn’t love sunshine in a dish? I think every time I’ve made risotto I’ve been doing it wrong – I always leave it on too long until it’s no longer liquidy at all. I need to give it another shot! This one looks so springy and delicious. i did that at first too. you definitely want it hydrated, as weird as that sounds. Sunshine in a dish, you say? Count me in! This looks great Jessica! I recently made risotto for the first time & loved it! I did lemon risotto with squid ink rice. Yum! I love this version though, with adding chicken. That way it’s a whole meal! squid ink rice! love that. I love a good risotto! 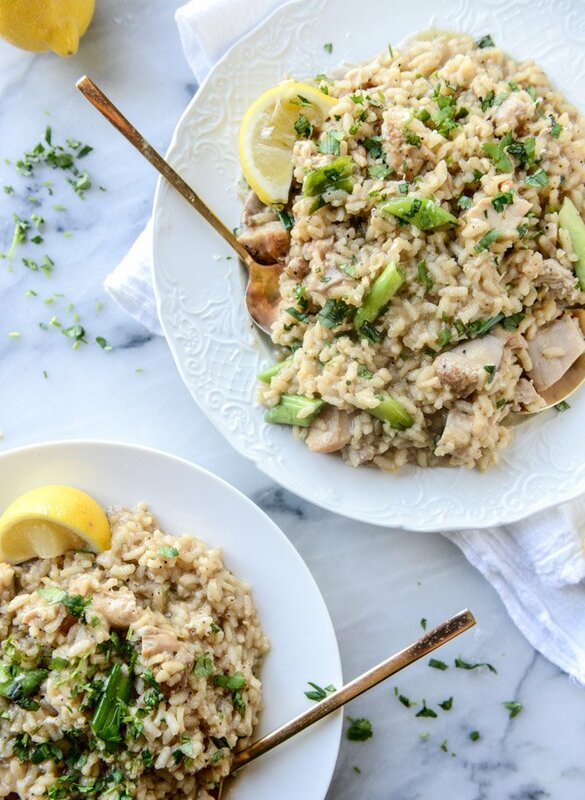 This lemon chicken risotto sounds like a winner, I’m definitely making this asap. Looks soon good!!! hey girl This looks amazing! I would love this! What a gorgeous spring dish! I’ve never cooked risotto, but I love ordering it when I’m out a restaurants. This would be a new favorite in my house. Sounds fabulous!! One question: you mention add “lemon zest” but there’s no lemon zest listed in the ingredients. Is it just to taste? Thanks for sharing! ah so sorry! i added it in, 1 teaspoon. thanks elita! omg you need to try! you really can add anything. This would certainly be wonderful for any weekend brunch! I make risotto quite often and this is one of the best risotto recipes ever! I just made it but substituted English peas for the scallions since that’s what I had. The lemon is so refreshing! I made this last night after drooling over your photos on Thursday! It was SO good, and surprisingly so simple! Your directions were super helpful for a first-time risotto maker, so thank you!! Also love the use of chicken thighs in here – a nice switch from boring old breasts. This dish was SO full of flavor! Awesome job Jess! So glad I finally faced my making-risotto-at-home fear because this was great and very easy! The only modifications I made were baking my chicken and throwing in some steamed asparagus at the end. Thanks for another keeper! Just made this last night and it has changed the dinner game. Honestly, this might be the tastiest meal I’ve ever cooked and it’ll be a go-to if I’m trying to impress a man. I’ve never made risotto before (always been too intimidated) but it turned out PERFECTLY. Thanks so much for another incredible-yet-simple recipe! I just made this for dinner tonight and it turned out so good! I love anything with lemon. It made this dish so refreshing. Thanks for sharing! I made this tonight. First time making risotto. Delicious and not too heavy. It’s a keeper! Hi Jess! Do you think that omitting the Parm would hurt this recipe too much? I have some cheese-haters I’m trying to impress at a dinner party (I know, I know). Thanks! Thank you for posting a risotto recipe that helped me conquer my fear of cooking risotto! We grilled our chicken instead of cooking it in the pan. I would definitely add peas or asparagus next year to brighten it up even more! It was so good! Great recipe! Was my first time making risotto and it turned out perfectly :) I used sushi rice and red wine since that was what I had in the kitchen (and also added a squeeze of lemon juice right before servicing since I am a lemon lover) and it tasted delicious. The scallions add a nice crunch! Made this and didn’t care for it. The risotto was just okay but the alcohol taste was strong even after cooking it for a long time. Also the big pieces of green onion did not go with the dish, they were too chewy and not needed. A small portion of chives would have been better. My kids liked it but only after adding extra Parmesan on top. My husband didn’t like it very much.